Bus tours around Niagara Falls in Ontario, Canada are available to take in the terrific sights. Bus tours are a relaxing and carefree way to enjoy the sights of Niagara Falls in Ontario, Canada especially on a double decker bus. Sitting on the upper deck of these bus tours gives you a better view of the sights and a greater opportunity for some excellent photos of Niagara Falls. Double decker bus, Niagara Falls, Ontario, Canada, North America. 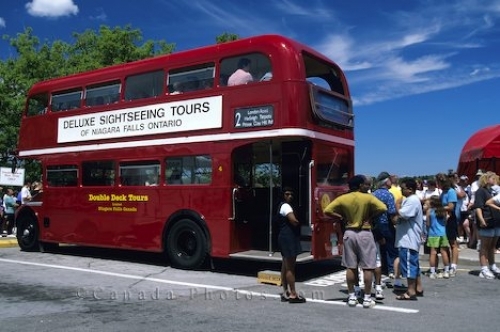 Photo of a double decker bus ready to take visitors on tours around Niagara Falls in Ontario, Canada.